Exactly five years, I created a Declaration of Dependence for my statist readers. It was supposed to be satire, but after looking at some new estimates of dependency, I now wonder whether I accidentally foretold America’s future. Anyhow, here’s how my attempt to be funny began. We hold these truths to be self-evident, that all people should be made equal, that they are endowed by their government with certain unalienable Rights, that among these are jobs, healthcare and housing.–That to secure these rights, Governments must rule over the people, deriving their just powers from the consent of the elite. While I like to think I came up with a few clever lines, it’s hard to laugh when you think about what’s happened ever since America’s real Declaration of Independence. Here’s what the Tax Foundation tells us about the evolution of taxation. Since our country’s founding, we have witnessed…federal revenues taking up less than 5 percent of our economy to more than 20 percent. …Taxation in the United States in 1776 was incredibly different than what it is today. There were no income taxes, no corporate taxes, and no payroll taxes. Instead, the government relied on a relatively modest set of tariffs and excise taxes. …taxes primarily existed on imports of goods and services to the colonies, as well as on the sale of particular products. What sort of items were these tariffs imposed on? Primarily, they were levied on ships on a per-tonnage basis, slaves, tobacco, and alcoholic beverages. In all, the average tariff worked out to about 10 percent of the value of imports. Amazingly, this very modest form of taxation lasted for more than 100 years. It wasn’t until that wretched day when the 16th Amendment was approved that the stage was set for the oppressive tax system that now exists. By the way, when there was no income tax, there also was very little government spending. 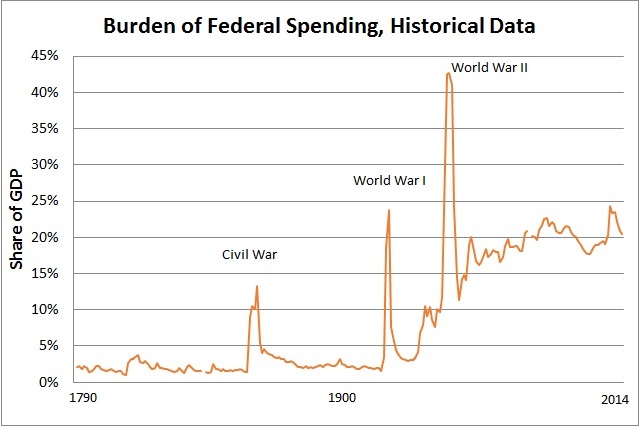 For much of our nation’s history, federal outlays consumed less than 3 percent of economic output. The burden of Washington spending today, by contrast, amounts to more than 20 percent of GDP. And I hate to even think about the long-run projections since I become suicidal. Oh, and let’s not forget the regulatory burden. We’ve gone from a system that had virtually no red tape to a nation that is now suffocating from a blizzard of bureaucratic edicts. All of which makes today more costly, as the Washington Examiner reports. Hundreds of federal regulations on beer, fireworks, hamburgers and even corn-on-the-cob cost families an additional $40, according to a new report on the July 4th tax. American Action Forum regulatory policy director Sam Batkins researched the regulations on the holiday treats to determine the costs. And they are huge. Here’s the infographic he created. Red tape adding $40 to our costs today? That will leave a bad taste in your mouth. Let’s close on an upbeat and inspirational note by reading Professor Randy Barnett on the drafting of the Declaration of Independence. The Committee of Five consisted of the senior Pennsylvanian Benjamin Franklin, Roger Sherman of Connecticut, New York’s Robert Livingston, the Massachusetts stalwart champion of independence John Adams, and a rather quiet thirty-three year old Virginian named Thomas Jefferson. After a series of meetings to decide on the outline of the declaration, the committee assigned Jefferson to write the first draft. …Jefferson did not have three leisurely weeks to write. He had merely a few days. Needing to work fast, Jefferson had to borrow, and he had two sources in front of him from which to crib. The first was his draft preamble for the Virginia constitution that contained a list of grievances, which was strikingly similar to the first group of charges against the King that ended up on the Declaration. The second was a preliminary version of the Virginia Declaration of Rights that had been drafted by George Mason in his room at the Raleigh Tavern in Williamsburg where the provincial convention was being held. …Mason’s May 27th draft proved handy indeed in composing the Declaration’s famous preamble. Its first two articles present two fundamental ideas that lie at the core of a Republican Constitution. The first idea is that first come rights, and then comes government. To be sure, the Founders’ view of rights was grossly imperfect. Blacks and Indians were grossly mistreated and women were not full citizens. But by the standards that existed then, the America’s Founders did a remarkable job of curtailing the power of the state and enhancing the rights of individuals. The good news is that there have been some significant expansions of liberty ever since the Declaration of Independence. A bloody war was fought in part to end the scourge of slavery. The toxic combination of racism and statism embodied by the Jim Crow laws has been abolished. And women now have full political and economic rights. The bad news is that there also have been significant contractions of liberty in the economic sphere. It started with the so-called Progressive Era, particularly the disastrous tenure of Woodrow Wilson. It then accelerated during FDR’s economy-stifling New Deal. Government’s size and power further expanded during the grim LBJ-Nixon years. And, more recently, we witnessed the debacle of a Supreme Court ruling that the very limited enumerated powers in the Constitution somehow give the federal government the right to coerce individuals to buy products from private companies. Notwithstanding all this bad news, I’m not quite ready to pack my bags for Australia. The United States was the only nation founded on a set of philosophical principles and I’m very patriotic – in the proper sense of the word – about being an American. I hope all American readers enjoy Independence Day. And in the spirit of the Founding Fathers, break a few rules. Dodge a tax, set off some illegal fireworks, and drive over the speed limit!